Learn the basics of Featherweight maintenance from expert Carmon Henry of The Singer-Featherweight Shop. Meet and learn from Lori Holt of Bee in my Bonnet, known and loved for her cheery vintage fabric collections, sew-along fun on her blog and her amazing books. She is well-known for her tips and tools that make quilting simple and fun. 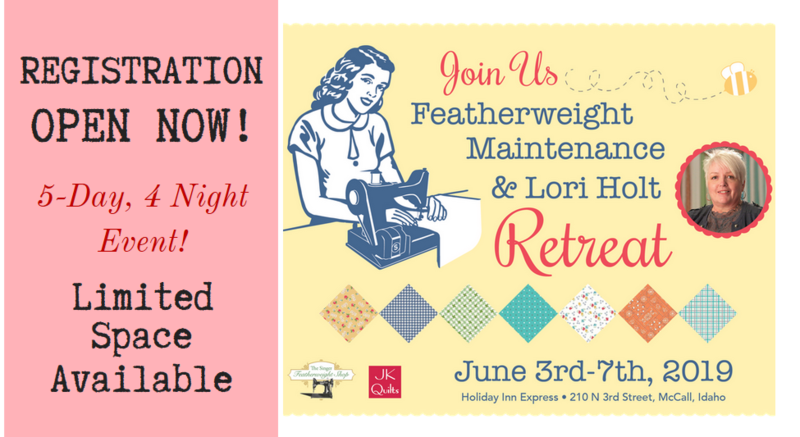 This retreat will feature fabric from her new Farm Girl Vintage fabric collection and pieced blocks from her Farm Girl Vintage book as well as some blocks never before seen! Ready to sign up? Don't wait; click "Register Now" to get all the details and sign up. Space is limited. Click here to get our exclusive coupon code for program participants.